Ex-Derry City defender, Shane McEleney is excited about Saturday's Irish Cup quarter-final with Ballymena. 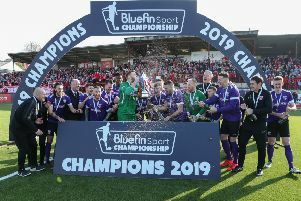 A FORMER Derry City trio are heavily involved in Larne Football Club’s incredible transformation and have bought into the Irish Championship club’s ambitious project at Inver Park. David McDaid, Shane McEleney and Thomas Stewart, who all once plied their trade with the Candy Stripes, have joined the Larne revolution and are targeting promotion to the Dankse Bank Premiership next season. The club endured a difficult start to the 2017/18 Bluefin Sport Championship campaign meaning despite heavy investment by billionaire owner, Kenny Bruce and the arrival of established Premiership stars, they missed out on sixth spot before this season’s league split. So while their assault on the league title must wait until next year, McDaid, McEleney and Co. have hopes of reaching an Irish Cup semi-final with Ballymena United standing in their way this Saturday, March 3rd at Warden Street. The Inver Reds’ incredible plans include a brand new 3G pitch and two new stands while Tiernan Lynch’s side are also set to become the only full-time club in Irish League football from next January onwards. And that’s a exciting vision which ex-City striker, McDaid and centre-half, McEleney both found too good to turn down when joining the club, especially as the owner, who founded Estate Agents, Purplebricks, handed the new arrivals the keys to a brand new house in Larne. Former Candy Stripes, David McDaid signs a two-and-a-half year deal with Larne. “When Davy (McDaid) signed he told me to meet Kenny (Bruce) and the manager and that people didn’t know what was going on at Larne,” explained McEleney. “Obviously we were looked after financially but Kenny couldn’t do enough for us as new players coming in, providing houses etc. “The pitch is being dug up on April 20th and a brand new 3G pitch is going down and there are two new stands at Inver Park going up. He’s got planning permission for that and the diggers are ready to come in. “That was one of the reasons why I signed with Larne as there’s not going to be any other teams going full-time other than us next year. “Everybody seems to be on the same page and once I talked to Davy and Tommy (Stewart) about it, they told me to come have a look and see what Tiernan and Kenny have to say. When I came up they showed me the plans for what they’re doing and it was first class. Creggan man, McDaid has also hit the ground running at the club, netting seven goals in seven games since January. He netted four of those against Knockbreda in an 8-0 win before scoring a magnificent strike in the 2-1 win over Limavady United and once again on Saturday in the 1-1 draw against PSNI. And, ominously for the opposition, he feels like he’s only getting started. “Everything is going well. It’s tough coming in halfway through a season but the manager and coaching staff are understanding and to be fair we’ve been playing well the last couple of weeks. “I’m happy with that return. You’re going to get chances in this team because there are loads of quality players around me. The likes of Tommy Stewart, Martin Donnelly and David Scullion. McEleney had offers to join Derry City, Sligo Rovers and Shamrock Rovers before he was enticed to agree terms with Larne while McDaid’s signing raised quite a few eyebrows having snubbed a move to reigning Premiership champions, Linfield following a season with Airtricity First Division champions, Waterford. Their presence at the club has considerably raised expectations and both McDaid and McEleney are hoping they can make their debut seasons one to remember by taking the scalp of Premiership outfit, Ballymena in the Irish Cup quarter-finals. The Cup run has captured the imagination of the club supporters and players alike with the club erecting billboards advertising the game around the town as excitement grows. And McDaid admits it’s the only game on his radar with nothing to play for in the league. “As you seen with Wigan against Manchester City, in Cup football anything can happen. “I don’t think we’re that big of an underdog but we’re a new team trying to play a new style of football, whereas Ballymena have a great manager and some great players.